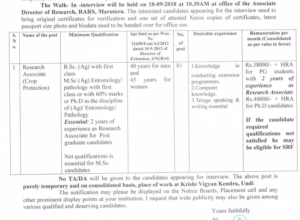 ANGRAU West Godavari Research Associate Crop Protection Recruitment 2018: 1 Vacancy – Acharya NG Ranga Agricultural University, Regional Agri Research Station, Marutery, West Godavari District, Andhra Pradesh has released an official job vacancy notification under the able guidance of Dr P Muni Ratnam, Associate Director of Research for Walk-in-Interview having subject as – Estt – KVK Undi – temporary engaging of research associate (crop protection) on consolidated basis – walk-in-interview on 18th September 2018 at office of the Associate Director of Research, RARS, Marutery – publicity – req – regarding. 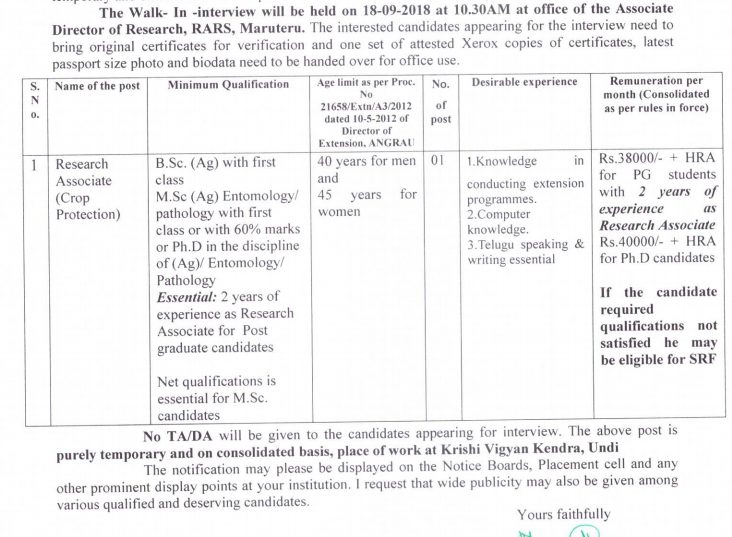 Candidates should find the enclosed notification to temporary engaging of Research Associate (Crop Protection) for filling up of vacant post of Subject Matter Specialist (crop protection) on purely temporary and on contract basis as per reference cited above at Krishi Vigyan Kendra, Undi. The Walk-in-Interview will be held on 18th September 2018 at 10:30 AM at the office of the Associate Director of Research, RARS, Maruteru. The interested candidates appearing for the interview need to bring original certificates for verification and one set of attested Xerox copies of certificates, latest passport size photo and biodata need to be handed over for office use. That’s all for ANGRAU West Godavari Research Associate Crop Protection Recruitment 2018.